A fabulously fun and flirty fascinator set on a fine headband. This piece of headwear is one of our most popular pieces of millinery suitable for any sized lady, either short or tall. We call it a small hatinator with a big presence. So if you are a lady who doesn't want to stand out from the crowd, but wants a 'presence' as racegoer or wedding guest, then this is a piece for you! 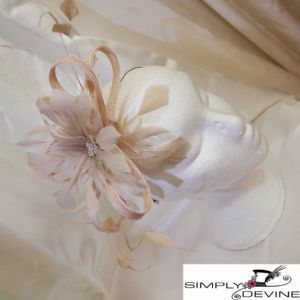 Simply Devine is a milliner of fine hats and fascinators for women of all ages. If you're looking for a hat or fascinator with distinctive design yet wish to maintain a classic style then look no further.